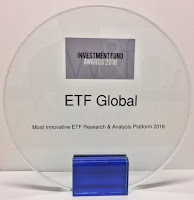 ETF Global: ETF Global® wins 2018 Most Innovative ETF Research & Analysis Platform! 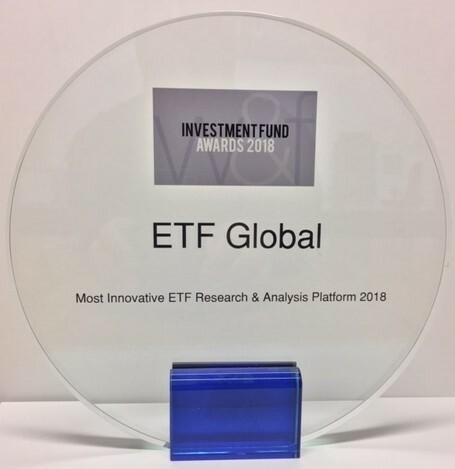 ETF Global® wins 2018 Most Innovative ETF Research & Analysis Platform! Friday, January 4, 2019 - In U.K. based Wealth & International Magazine’s 4th Annual Investment Fund Awards, ETF Global was announced as the winner of the 2018 Most Innovative ETF Research & Analysis Platform. About the Award - From Pensions to ETFs, Managers to Service Providers and everyone in between, the Fund Awards seek to showcase the very best of the best from around the world and across the burgeoning global investment fund landscape. The overriding aim of this award program is to acknowledge and reward those who work to provide their customers with the very highest standards of service and support in the funds market. After a months-long review process, ETF Global was selected from a multitude of candidates as 2018’s Most Innovative ETF Research & Analysis Platform. To advance from nominee to winner, candidates must be able to demonstrate expertise in a given area, dedication to client fulfillment, noteworthy performance or commitment to innovation. Ultimately, to ensure that one’s recognition is truly deserved, all award winners are chosen through a combination of votes gathered from W&I’s network of respected industry partners and their own rigorous in-house research and due diligence. Promisingly, this award coincides with our official expansion into the European market, as we recently opened our European headquarters in London. Europe is already home to a robust and fast-growing ETF marketplace, with nearly $750 billion in AUM. This market will offer ETFG many exciting opportunities to reach a broader global audience and extend its best-in-class data, research, analytics and solutions to a geographic region that will only continue to grow in importance in the world of ETFs.